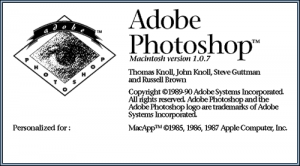 Its difficult to believe that 25 years have already passed since Photoshop graced our monitors for the very first time. Adobe Photoshop has become possibly one of the most iconic software programs of all time. It has changed the way we view our world, literally. The world was first introduced to it’s magical touch on the 19th February 1990. Almost all creative industries have embraced Photoshop and pushed the boundaries whether it is Fashion Photography, Nature Photography, Movies, Advertising, the Web, The Print Industry or even more recently 3D Product Design. ‘Photoshopping’ has become a part of the everyday language we use. Many of us accept that image manipulation through the many filters and tools of Photoshop helps to sell a product or even an aspirational way of life. The thin line between reality and digital manipulation is often blurred causing misrepresentation leading to misinterpretation of what is actually real. Thomas Knoll was the brains behind Photoshop. As a student at the University of Michigan, he developed the software, initially called ‘Display’ with his brother John. His main purpose was to make images appear clearer on his black and white Apple Macintosh Plus. The two brothers added features to the software which made it possible to process digital images. Graphic designers and Photographers all over the world instantly adopted Photoshop as their own. The ever increasing popularity of the Apple Mac had now forged a symbiotic relationship with Adobe which in turn hugely helped these fast growing brands. Photoshop really spread virally when it became available for the PC. Adobe had landed and now the world was at its fingertips. If you have ever wondered what the first image to be officially photoshopped was then look no further. ‘Jennifer in Paradise’ was taken in Bora Bora in 1987. It was John Knoll’s girlfriend at the time and later his wife. The Knoll brothers used the image as a reference point for colour and in many demonstrations of the software. This image of Jennifer has become an iconic representation of Photoshop over the years. This powerful image is instantly recognisable to Photoshop users all over the world. Today when we look at a digital image it is sometimes hard to peel back the ‘layers’ and reveal the true original. Manipulation in the digital sense can add depth an possibilities to any image. It can help that image stand up on its best footing but the greatest achievement of Photoshop is in the ability to let a digital image capture its true ‘reality’ and enhance it. Photoshop when used to its full potential needs to hold onto subtlety. Its magic should only be seen in the finer details and not the blatantly obvious. No matter which side of the screen you are on, whether you are image creator or image viewer, Photoshop offers a bottomless well of creativity that has lasted 25 years. May the next 25 years be as glorious and imaginative as we have been accustomed to. May reality and the creative mind always collide, blending both in a concoction of colour and endless possibility. Photoshop in its truest form will never ask why but always ask you why not!